o many, Last Tango in Paris is one of the great explorations of cinema's visual possibilities. Director Bernardo Bertolucci, like his Italian compatriot Antonioni, a relationship between his role and that of a painter. In fact, Bertolucci went so far as to base Last Tango on the work of Francis Bacon, widely regarded as one of the greatest painters of the 20th century. While they were in Paris ready to begin shooting of the film, Bertolucci and Marlon Brando, the film's star, saw a show of Bacon's images. It made such an impression on them that it changed their entire conception of how the film would work. 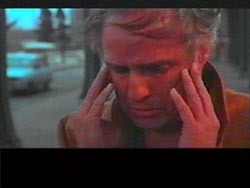 Bacon is best known for his tortured figures that evoke feelings of existential despair, and this is the dominant mood of Last Tango as well. 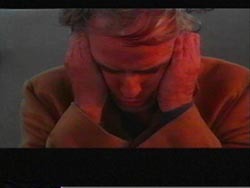 Bertolucci connects the worlds of Bacon and Last Tango from the very outset of the film when the two images you see above by Bacon lead directly from the credit sequence into the opening shot of the film. Let's look at that transition. It's a masterful shot, and with its moving camera it helps us feel the mood of this film as a kind of dance, one of exquisite beauty but also of great despair. Scroll your mouse over the three images of Paul (played by Brando) to reveal the images beneath them. They are from the bathroom where Paul's wife Rose had slit her wrists, and suggest that what is behind Paul's despondent condition is Rose's suicide. 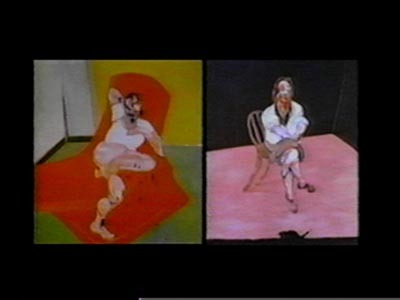 The woman shown in them is cleaning the blood out of the bathtub, and has been filmed through textured glass such that her face is distorted in a way that recalls Bacon's faces. 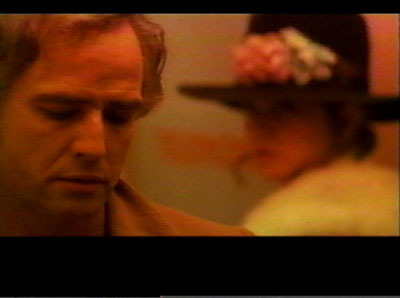 Below, using the buttons, you can compare stills from Last Tango with some of Bacon's paintings. Look for correspondences along the lines of 1) Color (Bertolucci once called Last Tango an "orange" film); 2) Theme or subject matter: both artists, for example, seem fascinated by the the human body's potential for decay and distortion; 3) Composition: The structure of the apartment that forms the central set of Last Tango, with its lines around the baseboard of the wall and its almost circular quality, evokes Bacon's compositional technique of dividing his canvases horizontally with an arc. Also, the contorted postures and gestures of characters in Last Tango often allud e to Bacon's ways of rendering figures compositionally in his paintings. 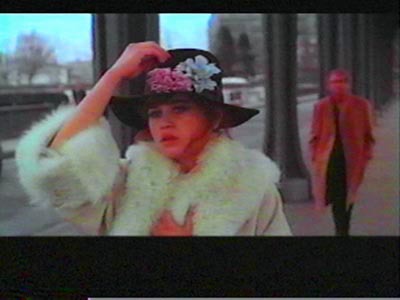 Incidentally, we will have the privilege this semester of watching Maria Schneider play another wonderful role a few years after the filming of Last Tango--that of the unnamed girl in Antonioni's The Passenger. On a purely narrative level, one could say that not much happens in a scene like this--the two main characters of the film meet by chance. But visually the scene is dynamic. Look at the way it is set up. 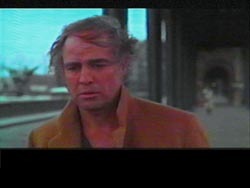 The tramway bridge above allows for the opening shot of Paul's anguished cry (could Bertolucci's inspiration for this have been spontaneous, after he had already chosen the location because of its long walkway?). Below, that long concourse allows the camera to track both characters as they move from background to foreground and then overlap. The space is so long that the camera is able to switch directions after the two pass each other and still find plenty of room in the other direction. The camera's movement throughout this scene is deft as well as graceful. We first saw it come down toward Brando's character from the top. It curved subtly and expertly, but its movement was quick--even aggressive. These qualities characterize the movements of the tango, which you will see the two main characters perform at the end of the film. The dance is a powerful scene, because it finally iterates what has been suggested all along in the film's choreography--both in the movements of the camera and of the characters. We feel swept away by the beauty of the tango despite the tragic quality of the events it accompanies.